Navaratri is a Hindu festival of worship of Shakti or Parvathi or Durga. These are nine nights of festivities. The word Navaratri means nine nights in Sanskrit, nava meaning nine and ratri meaning night. During these nine nights, Goddess Parvathi is worshipped in nine forms. The tenth day is celebrated as Vijayadhasami. If it is Shivaratri for her husband Shiva, Navaratri is exclusively for Shakti. The difference is that, Mahashivaratri is celebrated on one particular night in the month of march, but navaratri for shakti is celebrated for nine days. Ofcourse, there are the monthly sivaratris. In most states of India, Durga Puja is celebrated in different names. Navaratri is also celebrated four times a year in some parts of the country. In Tamilnadu, as far as I know, the most popular celebration of navaratri is in the month of Purattasi (September-October). One can find more details on navaratri on http://en.wikipedia.org/wiki/Navratri. The first three days are devoted to Parvathi as she is popularly known in Tamilnadu – goddess of power, the next three days are devoted to Lakshmi – goddess of wealth, and the last three days are devoted to Saraswathi – goddess of wisdom. The tenth day is celebrated as Vijayadasami – the day goddess durga defeated the demon mahishasur and she is worshipped as Mahishasuramardhini. Beyond these religious aspects, worship techniques or maintenance of rituals and customs, which might differ with every household, I have always been more concerned and attracted to the cultural and traditional aspects of any festival. In Tamilnadu, the ninth day is celebrated as Saraswati Poojai and Ayudha Poojai and tenth day as Vijayadasami. For Saraswathi Poojai, all our books would go to the Poojai Arai or Puja Room and appa would make a beautiful seating arrangement covering all the books with special new silk dhoti, on top of which the usual framed photo of goddess saraswathi with the veena on her hands would graciously sit. Sometimes we would give our gold chains to adorn saraswathi. That day, used to be the happiest.. More because we would be instructed not to study or even read any book. Suddenly by noon, I would feel so bad not studying or reading my favourite magazines! I wouldn’t have missed my books so badly any other day!! Ayudha Poojai would be marked by cleaning all instruments, equipments, metallic substances of day-to-day use – cycles, bikes, cars, all musical instruments at home. Everything associated with the household or work places would be cleaned, decorated and worshipped. Agricultural equipments for a farmer, type writer in a typing class, sewing machines, an aruval (sharp big knife specially for coconuts) for a coconut vender and so on..
All new ventures would begin from Vijayadasami. Even today, some schools take in children for kindergarten sessions starting from vijayadasami day. It is believed anything started on this particular day would be successful. All forms of art classes are started from vijayadasami. Every year, on that day, we show our special gratitude to our art teachers – whom we regard as goddess saraswathi herself. 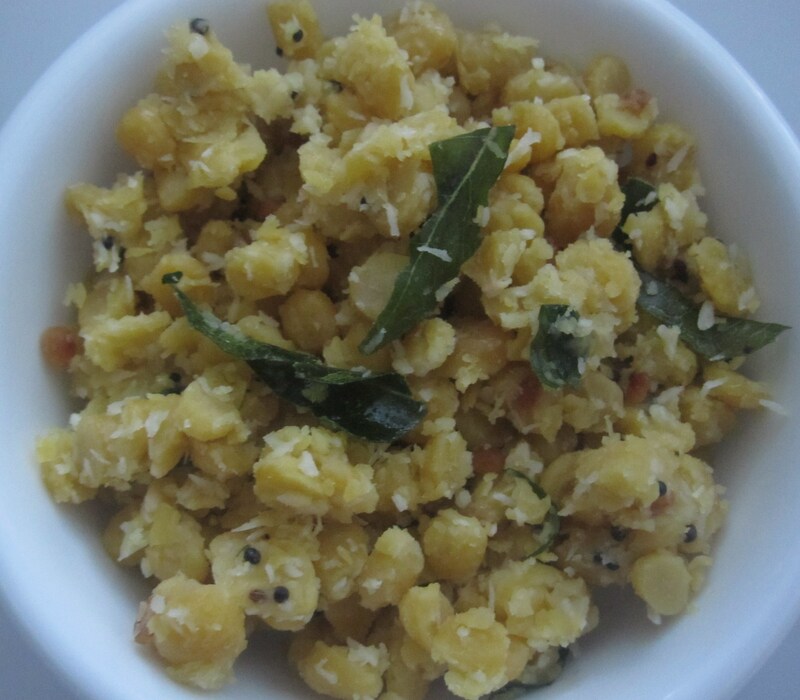 When I was very young, navaratri meant sundal everyday (can I call it cooked lentil salad? ), a different one every day.. After a few years, it used to be wearing the best of pattu pavadai (traditional long skirt and top in silk) and go to other houses in the neighbourhood, sing Carnatic music in front of goddesses and not to forget – collect the day’s sundal from their house. After a while, it was more of performing at home and neighbourhood (irrespective of what the neighbours or relatives feel – we are singing for the goddesses!). But still, more memories are stuck with the different kinds of sundals prepared and the golu decorations in some households. Navaratri in tamilnadu is very much marked with golu or kolu. Apart from the traditional kolams or colored rangolis, golu is a kind of a decoration of dolls and other beautiful innovative things. Some arrangements might have five steps, seven steps or nine steps generally or always in odd numbers. Golu would be arranged with traditional dolls collected for generations, some of the gods and goddesses, some depicting epic scenes, also some new dolls – all displayed with a sense of ethnicity and beauty. It can be called a household exhibition of innovative artistic skills. I find this golu decoration similar to the Durga Puja Pandals in West Bengal. If those pandals are a community event and done on a large-scale through committees or organisations, the one in Tamilnadu is a household affair – innovative, ethnic, traditional and religious involvement and excitement intact. Now, to Sundals or lentil salads! Sundals can be associated with mainly two things – one navaratri and the other – Beach! The beaches in Chennai and other places in Tamilnadu are always remembered with the sale of different kinds of spicy, tangy sundals. On beach sundal we shall talk in another post.. Now on navaratri sundal. There used to be no golu decoration in our house. But worship of goddesses on all days with different sundals and distribution in the neighborhood was always there. 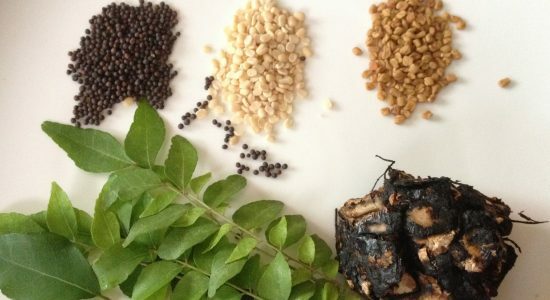 In this session, let me share making a few varieties of sundal. This can also be served as a healthy starter for dinners.